Don’t even think about going near a professional referral source until you’ve addressed these fundamentals. You’ve probably noticed: working with referral sources is harder than it used to be. 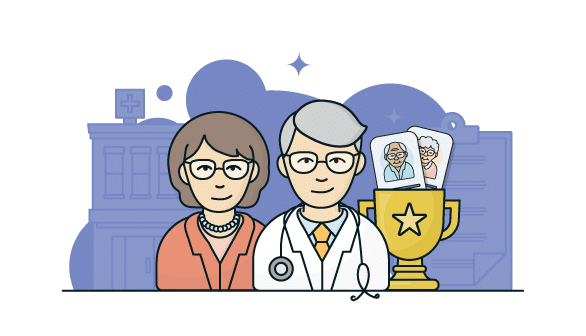 Home care agency owners we talk to frequently lament that simple strategies which used to be great at building inroads with referral sources rarely get them through the front door nowadays. Whatever the cause, it’s clear that agencies who want to be a main partner to referral sources will need to be more strategic and more focused in these efforts than they were a few years ago. You don’t need a completely different approach or a bold new strategy that no one has heard of before. What you do need is a deliberate approach that combines simple fundamentals into a powerful, consistent process. 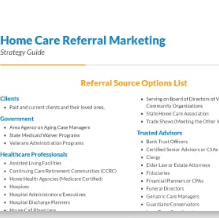 Create a plan to get more home care referrals with the Referral Marketing Strategy Guide. 1. Choose a few sources to build strong relationships with (as opposed to a ‘shotgun’ approach with a large number of sources). 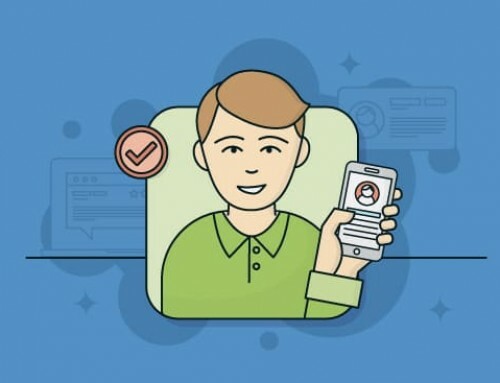 Most experts agree that you’ll have a lot more success by focusing on marketing to a few professional referral sources and maintaining very strong relationships, rather than casting a wide net and hoping for the best. We suggest identifying three to four key partners each with a different specialty; for instance, one skilled nursing facility, one home health agency, and one hospice. You should track and measure the return you get from each source over time and adjust your focus toward the sources providing the most billable hours. 2. Prepare a packet to leave with them. 3. Make sure that you can return their calls immediately. We’ve written before on the importance of immediate follow-up and quick communication with referral partners. If you establish that communication with your agency is easy and quick, they’ll come back to you in the future. If you set a precedent of sluggish communication, you’ll find it hard to move back up their list. If your office staff is swamped with tasks to the point that it slows down your communication, you should consider working out your internal logistics before trying to make more inroads with referral partners. If you’re not sure what the optimal size of office staff is for your agency, check out this guide on deciding how many home care office staff to hire. 4. Be able to effectively explain to them what value your agency has over other home care agencies they could use. Why should they send clients to your agency instead of others? It’s critical that you have some method of differentiating your agency, whether it’s specializing in certain forms of care or proving that you can deliver health outcomes. If you can’t answer the question of what sets your agency apart from others, the referral source definitely won’t be able to answer this question either. This is a topic that our CEO, Erik Madsen, has talked about repeatedly in recent months because it’s becoming so important. This chart shows data from the 2018 Home Care Benchmarking Study. Note that most of these points are pretty generic. You’d be hard-pressed to find an agency that didn’t say it had high quality caregivers, exceptional customer service, strong client satisfaction, and a high level of professionalism. These are important to have–but if they’re your point of differentiation, you need to be able to back it up with exceptionally strong proof through client testimonials/reviews, exceptional word of mouth, or other proof from someone other yourself. Otherwise, you’ll sound just like every other agency clamoring for a referral source’s attention. 5. Create a system to regularly follow up with them and maintain communication after the visit. Using a simple CRM software can help you to plan tasks ahead of time for each referral source and easily set them to remind you when and how to follow up with each source. 6. Ensure that you’re ready to staff the clients they send your way. This is probably a no-brainer, but it needs to be said. Staffing issues and other challenges are causing many agencies to turn away clients, even if growth is one of their top priorities. While caregiver turnover can be a tough nut to crack, you’ll need to ensure that you’re ready to staff new clients. After you turn away a few clients, the referral source is likely to start turning to other agencies first. Of course, there may always be isolated times when you’re unable to staff a client or when it wouldn’t be productive to do so. You can mitigate this problem by clearly establishing the types of shifts your caregivers can fill (for instance, the minimum number of hours required for a shift) and giving your staff a script to clearly reiterate and explain the policy if it becomes an issue during a call with a referral source. 7. Do your homework on the referral source so that you can ask educated questions. Your top priority should be understanding their needs and communicating to them that you can help make their work easier. To this end, you should do as much research as possible beforehand: talk with any contacts you have ahead of the formal visit, familiarize yourself with your website, and talk to other care providers in the area. The more you can understand their circumstances and unique challenges before you visit, the better-placed you’ll be to demonstrate that your agency is equipped to help them. Once you’ve done your homework, consider the right questions to ask. Beyond logistical questions, you need to ask questions that will help you understand what is most important to them and what their frustrations are. If you can pinpoint what frustrations they might have currently with agencies they’re already working with, you have an clear route to explain to them how your agency can benefit them. 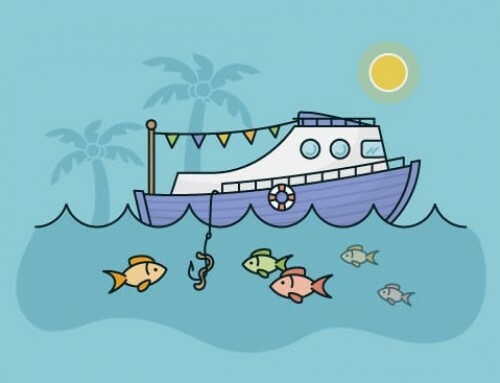 Hopefully you’ve noticed a clear undercurrent to this article: the most effective referral networking is focused on delivering wins for both the home care agency and the referral source. When talking to professional referral sources, you should focus much more on how you can help them than how they can help you. Don’t misunderstand; you’ll still benefit from doing this. But by focusing on their needs rather than yours, you’ll be setting the stage for a strong, positive partnership that will serve the interests of both sides. What have you found to be most useful to do before you meet with a referral source? Let us know in the comments below! If this article was useful to you, don’t forget to subscribe to our blog and get regular content like this delivered right to your inbox. Thanks and glad to hear it! 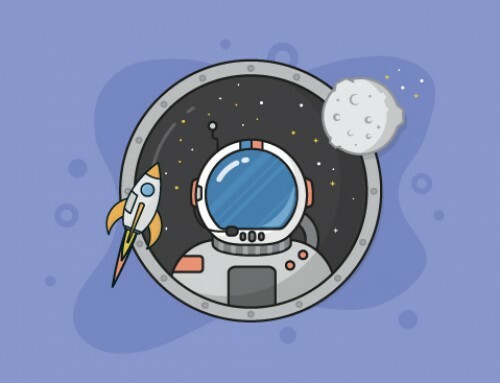 Any future topics you’d like to see articles on?